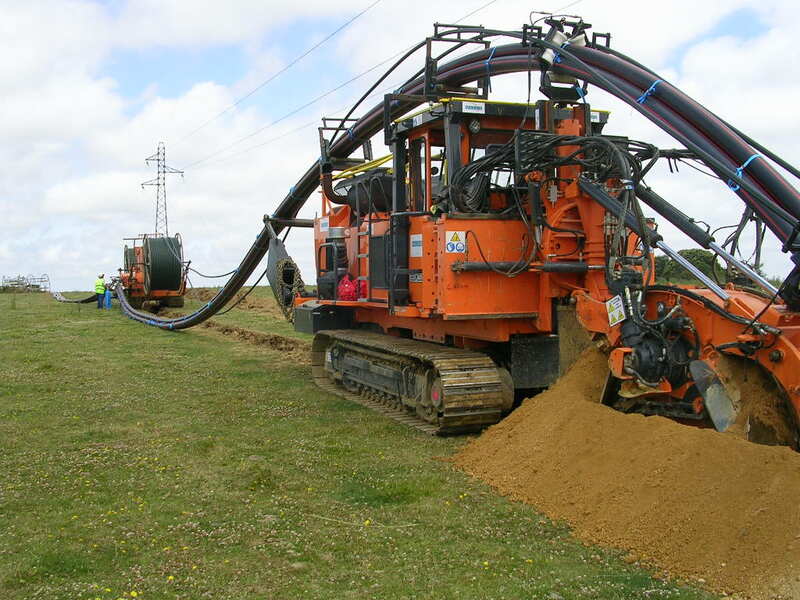 In 1974, Jacques Marais inventes in the Maine et Loire Region (West of France) the first equipment allowing mecanical laying of cables. 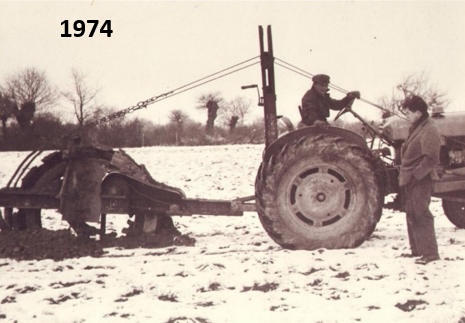 At the time, the rocksaw is simply mounted at the back of a standard agricultural tractor. The improvement of this process then made the success of Marais. Since its invention, this process has permitted to deploy efficiently more than 100 000 km (60 000 miles) of networks. 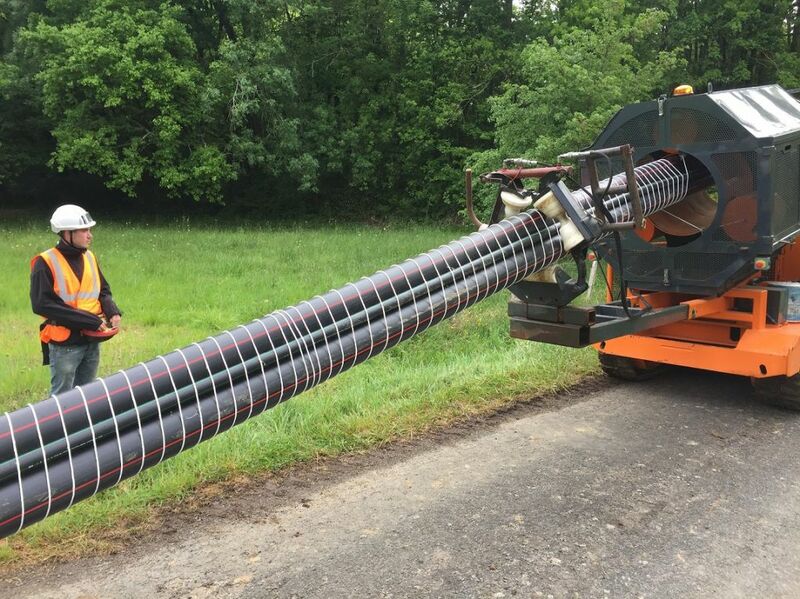 Mechanical laying is a process dedicated to burying networks (mainly Telecom and Power) into the ground thanks to the use of a laying unit. 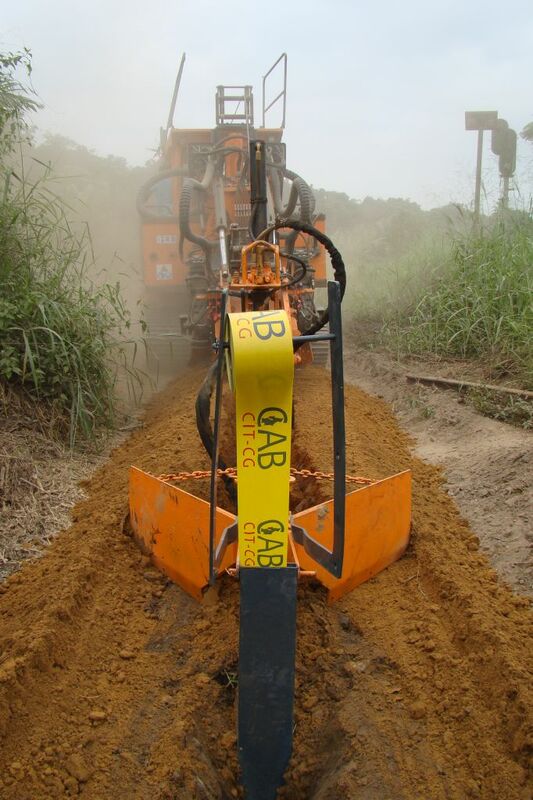 This unit guides cables or pipes into the trench and position them precisely as per specifications. Thanks to our technology, trench opening and networks laying is done simultaneously and safely (no worker needs to walk into the trench). 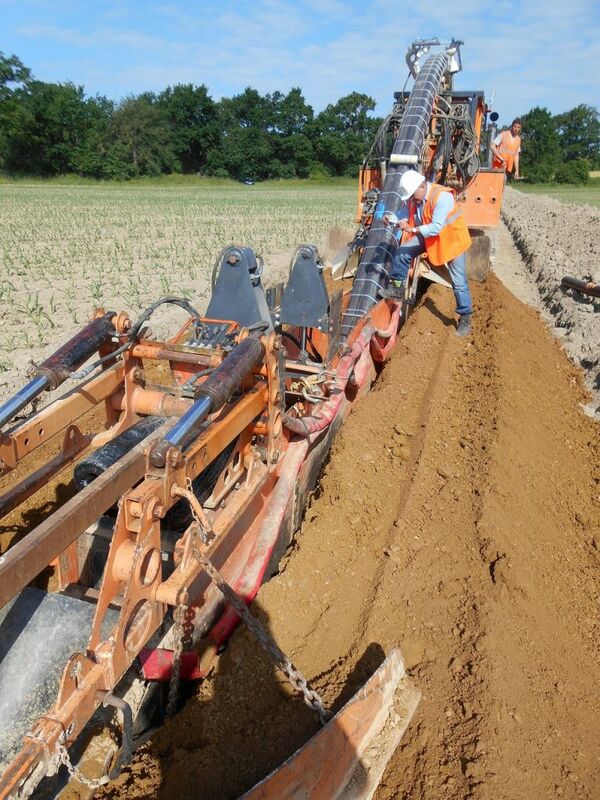 Mechanical Laying allows to lay networks underground while opening the trench. To start, reels need to be carried in front of the work area. Marais proposes a solution to carry, move and unroll up to 3 reels of 20 tons (44 000 pounds) or 6 reels of 10 tons (22 000 pounds). In certain conditions, it is necessary to bundle cables or ducts, usually in a group of 3, so that they remain properly maintained in the trench. A specific trenching rocksaw is designed for this process. It allows to open trenches from 23cm (9 inches) to 55cm (22 inches) wide and up to 160cm (5 feet) deep. The process can be used with large quantities of cables (more than 40) and on projects requiring laying in curbs (see below). 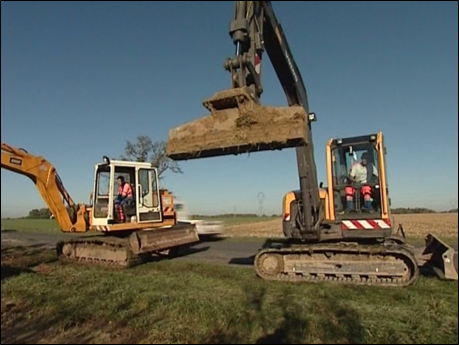 Cables or ducts are positionned in the trench thanks to a specific shout called the laying box. Guides located inside the box protect cables/ducts and ajust their exact position in the trench. The clean trench bottom and the constant trench depth allow a steady laying. 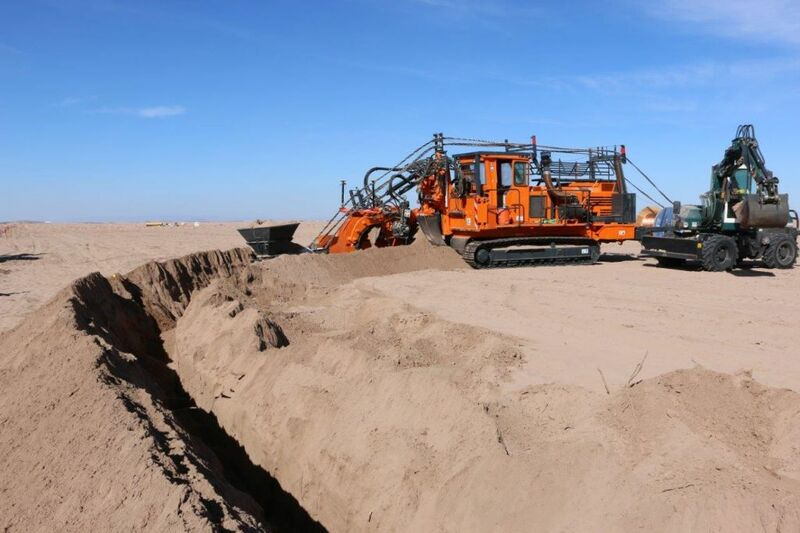 At this stage, sand can also be added in the trench in order to isolate cables. 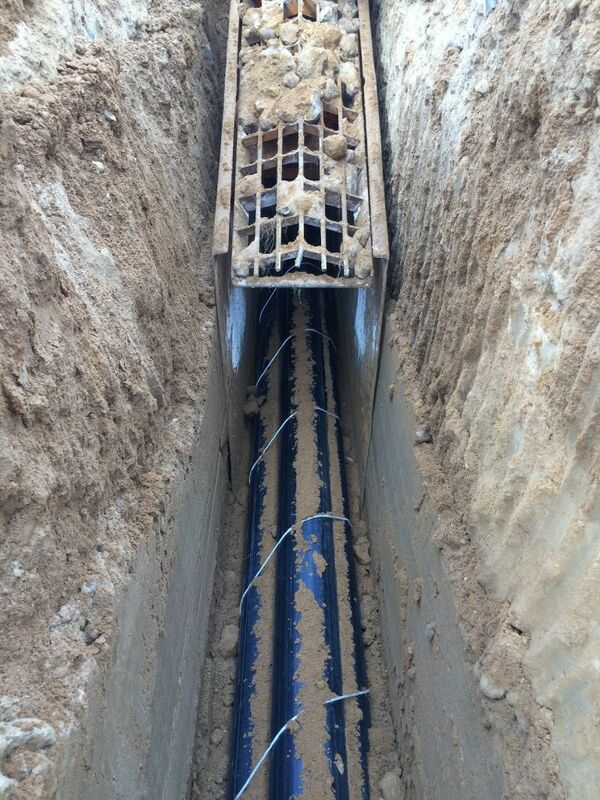 The backfilling and the compacting are successively done when cables/ducts are inside the trench. Excavated ground piled next to the edge of the trench can be used for refilling. Cheaper : Construction costs are reduced by up to 40% allowing a quicker return on investment for the project owner and more competitive rates for the construction company. 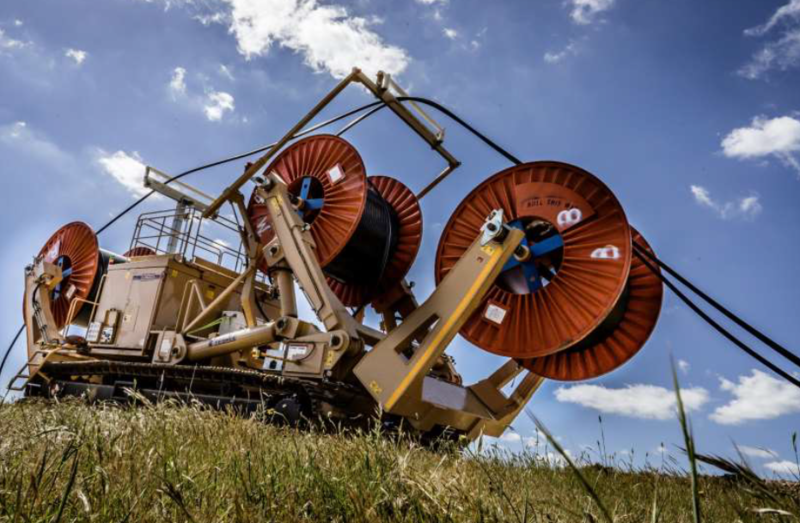 Faster : A fast deployment of 400m (1300 feet) per day in hard ground and up to 2500m (1.5 miles) per day in soft ground allowing a quicker implementation. Project owner can start generating revenue sooner. Safer : Workers don't have to walk in the trench to place cables anymore. Better : Cables/Ducts are positionned precisely as per specifications. Same applies to the sand and to the warning tape.